The 80’s are over. The karate kid is all grown up and the mullet isn’t acceptable for business or party. 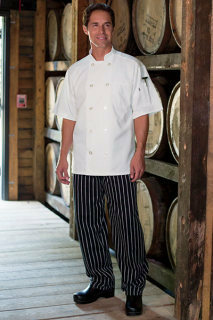 So why are you still wearing baggy peg legged pants This classic styled chef pant features a timeless design with a conventional straight leg that fits you like a trouser, not a potato sack.